The school year is almost at an end, but although I’m winding down my teaching for the summer I’m also busy planning and preparing for a couple of concerts in the autumn. On 11th October David Hammond and I will be sharing a concert with Sheffield-based clarinet quartet Black Velvet. It will include Milhaud’s Suite for Violin, Clarinet and Piano, which Steve Dumpleton will perform with us, but the rest of the programme is a work in progress, so more on that another time! On Saturday 20th September I am putting on a very exciting concert in St Andrew’s Church, Sheffield, in aid of Marie Curie Cancer Care UK. Tim Horton, pianist in Ensemble 360 and the Leonore Piano Trio, will join me to perform Mendelssohn’s Concerto for Violin and Piano. This work is one of Mendelssohn’s earliest concertos, written when he was only 14 and given its first performance by the composer himself on piano and his violin teacher of the time Eduard Rietz. It is scored for string orchestra, although in large sections of the piece the soloists are left without accompaniment, which at times almost gives it the feel of a sonata. The concert will also include Symphony no. 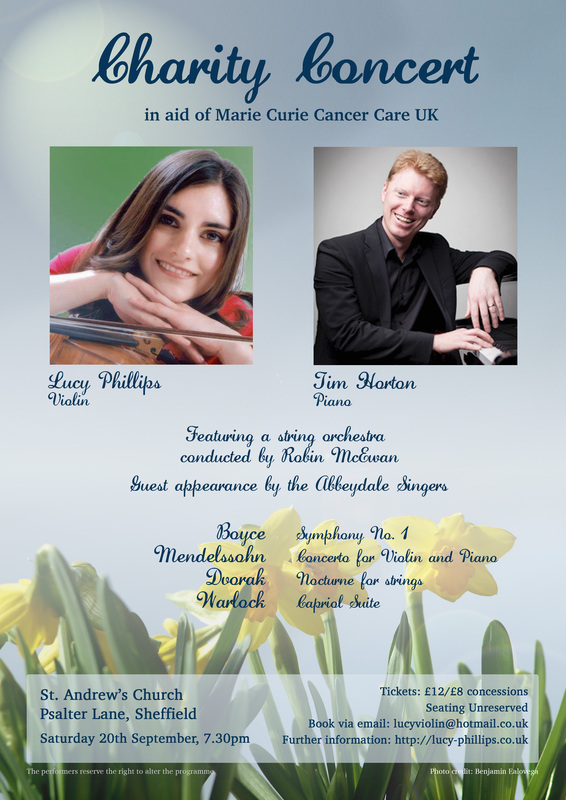 1 by William Boyce, Dvorak’s beautiful Nocturne for Strings and Warlock’s Capriol Suite, all conducted by Robin McEwan. As if that weren’t enough there will also be a guest appearance by the fabulous Abbeydale Singers. Tickets are now available, priced £12 and £8 for concessions; contact me for information on how to purchase them.